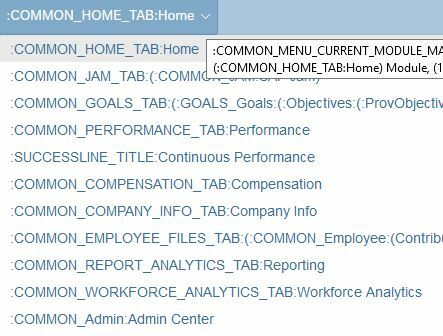 In this blog I would want to show how in SuccessFactors Labels for Standard fields can be modified as per client requirements. The fields could be in PP3, MDF, Portlets, HomePage Tiles, Menus and many more. We will not talk about Text Replacement here as it has very limited options. Firstly I would take a typical scenario which most of EC customers ask for changing the label of effectiveStartDate field in MDFs(standard or custom) and in one of SAP KBA NOte(2646360) this was marked as not doable! Below is the screenshot of an Effective Dated Custom MDF and I have highlighted the text which comes for effectiveStartDate field and we will make use of 3-tier architecture of SF. Step 3 – Go to Change Language and select English Debug and click on switch. Step 4 – Now system will take you to homepage where you would see lots of keywords, colons and texts coming up for each system label, as below. 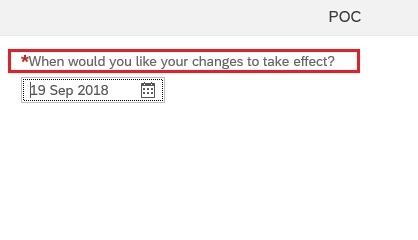 Step 10 – Now create a New csv file with same structure as Messages.csv file and in column B, you can replace the original text “When would you like your changes to take effect?” with the NEW text “Effective Date” and save the file. 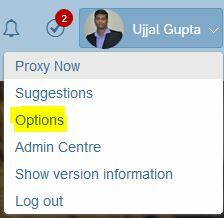 Step 12 – Now click on 3 dots and you would see below actions available against the new custom language created. Please click on upload custom labels and upload the new Messages .csv file created in Step 10. Step 13 – Once the file is uploaded you will see below message in provisioning which will confirm the new file is uploaded and saved for your instance. BINGO!!! The Label for standard field in MDF(custom or standard) has got changed. Always ensure to upload all the custom labels going forward into you custom language pack, else the new file will overwrite the existing keyword changes in the instance. Always check thoroughly the IMPACT of modifying the text for a particular keyword in one screen, as it may have impact on multiple screens. For eg: The change we did as an example here will be applicable to any standard or custom MDF which are effective dated. So I can’t use a verbiage here specific only to a custom MDF as the change would impact all effective dated MDF screens! Changes of these nature are always complex and risky in nature so be wise in making decisions around this and doing the changes and inform clients appropriately to make label change related decisions. Lastly this method is also useful during implementation with Multiple Languages and can be used for client specific Translation in any other languages like French, Chinese, Spanish etc. Happy customization using standard ways! !